See all the best Festival & Events tours in Mexico. There are 6 trips to choose from, with the tours varying in length from 5 days up to 16. A Day of the Dead tour can be experienced in November and focuses on the compelling Mexican cultural traditions believed to help the souls of deceased loved ones on their spiritual journey to the afterlife. 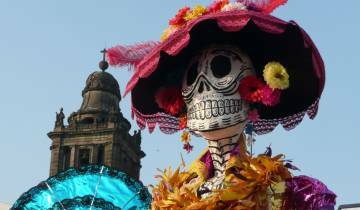 You can attend a Day of the Dead ceremony or parade and experience the festivities first hand.